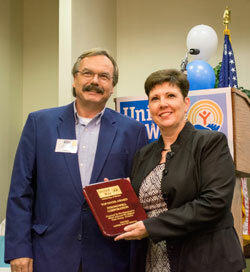 Since its inception, the United Way of Bristol has been recognizing organizations’ outstanding achievements at its annual luncheon, where awards are given for outstanding contributors to United Way of Bristol. This year’s Top Giver Award was presented to Strongwell, where Strongwell collectively raised over $115,000 towards this year’s campaign themed “Be the Good.” The President’s Award was also presented to Strongwell, for achieving 90-100 percent of its Fair Share potential. Each year, Strongwell’s internal campaign team coordinates community speakers for multiple employee meetings in order to educate and advocate on how community dollars benefit the less fortunate. The Campaign Chairman’s award went to Bristol Herald Courier for their substantial increase in year-over-year employee contributions. In addition, the President’s Campaign Award was given to Settler’s Life Insurance Company for its excellence in both donations and volunteerism to the community. Great job, everyone!